For details about new features and functionality in the previous release, see Rational Team Concert New & Noteworthy 5.0. Individual workflow states are now displayed as subcolumns on the taskboard. You can easily see the state that a work item is in, and you can transition work items by dragging them. When you drag cards between columns on the taskboard, the valid transitions in the workflow are displayed as green columns. This identification of valid transitions helps confirm which cards to move on the board. You can now configure the columns and subcolumns that are displayed on the taskboard. This configuration option enables your team to see only the parts of the workflow that it needs. The configuration user interface makes it easy to see which work item types use a particular state. The taskboard now supports small, medium, and large card sizes. These size options enable you to zoom in and out to see more or less detail on the cards. The set of attributes on each card size is configurable. The WIP limit color scheme is simplified: The color is green when you are at or below capacity, and red when you are over capacity. Work items that are excluded from the plan are now also excluded from the WIP calculation, which means that the number of items reported as "in progress" matches what you show on your board. Beginning in this release, the browser Print action can be used to print all loaded plan items for a displayed plan view. In previous releases, printed output for plan views included only plan items that were visible in the viewable area of the active browser page. It was not possible to print plan view content that spanned multiple browser pages. That limitation was removed in this release. For printed output that most closely matches the browser display, enable the browser option to print background colors and images. Formatting of printed output might vary depending on the browser used to initiate print requests. For tree views, larger plans usually load 20% to 30% faster in Rational Team Concert 5.0.1 compared to the previous version. In real-world test cases, plans often have many levels of nesting with large numbers of outplaced child items. 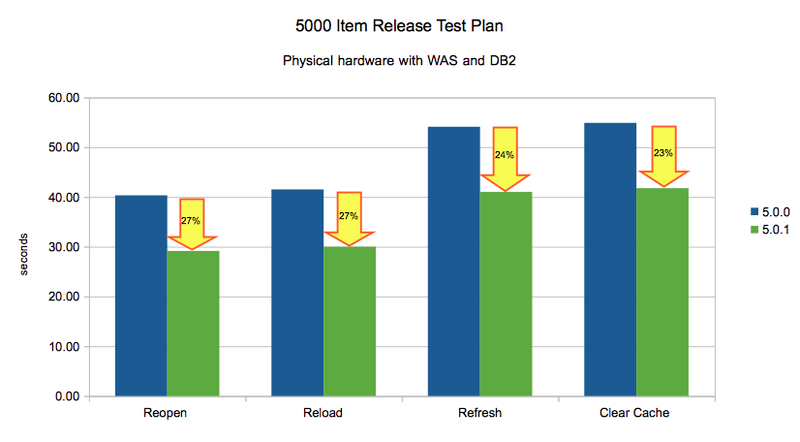 In these cases, results showed performance improvements of 60% and better. To improve plan loading performance, improvements were made to tree views, which included fine-tuning concurrent server requests and the timing of client-side attribute processing. The greatest improvements come from deferring the loading of child items that are shown in the plan but not scheduled for this plan ("outplaced" child items). You can now refresh work items in a group. In the Actions column of the group that contains the work items to refresh, click the down arrow, and then click Refresh Work Items. Note: This works only for work items that are already shown in the plan. The order can be switched to oldest comment first by using the button provided at the upper-right corner of the comment editor. You can reply to a specific comment, which automatically adds the text @username, in reply to comment#, to the beginning of the comment in the comment editor. The Quick Planner feature offers an easy way to manage any type of project by using an agile approach. You can start getting organized right away by creating and assigning work items for your project. This feature can simplify your project planning and increase the speed of your workflow. For example, you can drag items from one project phase to another, such as from your project backlog to a sprint. You can also use icons to quickly assign work item attributes. The Quick Planner feature is available as a technical preview with Rational Team Concert 5.0.1. To try the Quick Planner feature, download the .zip file from the Quick Planner download page. The Readme file in the .zip file provides the details about installing the patch. The History view is enhanced to show the date that a change set, or baseline, is added to the history, as well as the person who added it. This information is available in the two new columns "Added By" and "Date Added" as shown in the following images. These new columns display when the history of a component is shown in a repository workspace or stream (Show > History), or when you show the baselines in a repository workspace or stream (Show > Baselines). When you view the history of a stream, the new information shows the person who delivered the change sets or baselines. When you view the history of a repository workspace, the new information shows the person who accepted the change sets or baselines. The "added by" values can also be the result of other operations, such as replacing a component or creating a new repository workspace or stream. The SCM command line interface also provides the new "added by" information, as shown in the following output. The output of these commands has changed since Rational Team Concert 5.0, and it is suggested that any scripts that rely on the CLI output use the JSON flag. For more information, see Scripting using the Rational Team Concert SCM Command Line Interface. (1027) 6876 "Another test work item"
(1028) 6875 "Test work item task summary"
(1012) ----$ "Initial for 314041 Component"
Component: (1007) "314041 Component (Real)"
The lightweight work item editor in the Rational Team Concert Visual Studio client is now process aware. You can configure an editor presentation for a lightweight work item by using the Rational Team Concert Web UI or Eclipse client. The lightweight work item creation dialog box in the Visual Studio client changes accordingly to reflect this. When you run the ClearCase Version Importer to migrate source control data to Rational Team Concert, you can now run a command at the end of the migration to verify whether the imported content is identical to the content in Rational ClearCase. The command reviews the file system structure in both Rational ClearCase and Rational Team Concert source control, compares the file contents and file metadata, such as the check-in date or version attributes, and reports any differences. You can optionally verify file versions in the history. By default, the command compares the Rational ClearCase dynamic view content with the Rational Team Concert baseline and metadata for files in the file system. The following examples demonstrate how and when you might use the command. When you have the intermediate data that is imported to Rational Team Concert, you can specify the data directory in the new command, and it verifies all the Rational Team Concert baselines. Note: The command must be run on a system that has access to both Rational ClearCase and Rational Team Concert. 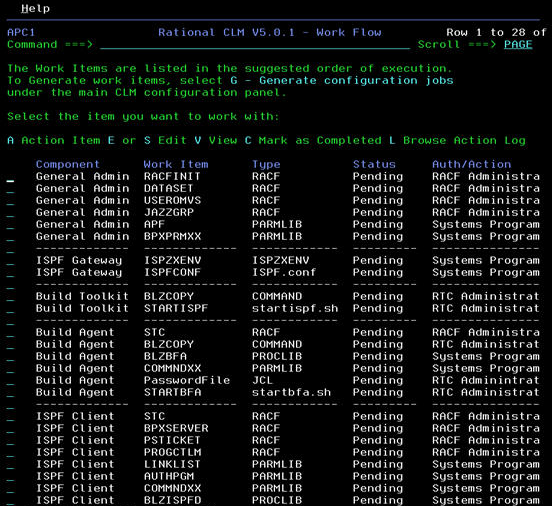 The Rational ClearCase client must be installed on the system to access the VOBs through the dynamic view. 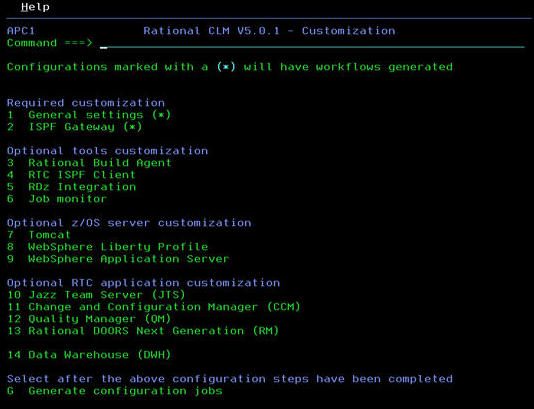 The Collaborative Lifecycle Management (CLM) configuration utility is an ISPF-based utility that helps you to configure the components of CLM on the z/OS platform. You select the components to install with the configuration utility. A customization displays the required and optional components that can be installed for CLM. Depending on the previous customization, the configuration utility application creates a list of workflow items that perform the configuration. The workflow is presented in a logical order of items to process. You can now add buildable files that are associated with a work item to the subset. To add the files, click Add files > Using Work Items in the Buildable Subset editor. You can now run a preview of a work item promotion without granting the permission to run an actual promotion. Set the permission in Process Configuration > Team Configuration > Permissions. In previous versions of Rational Team Concert, when you ran a preview of a work item promotion, a report was generated that lists errors that occur if the promotion actually runs. Previously, when a promotion precondition error was encountered, the preview stopped processing, which means that other types of errors were not reported (for example, change-set conflicts). In this release, the promotion function is improved so that the preview continues and reports the precondition errors, in addition to reporting other errors that are detected. 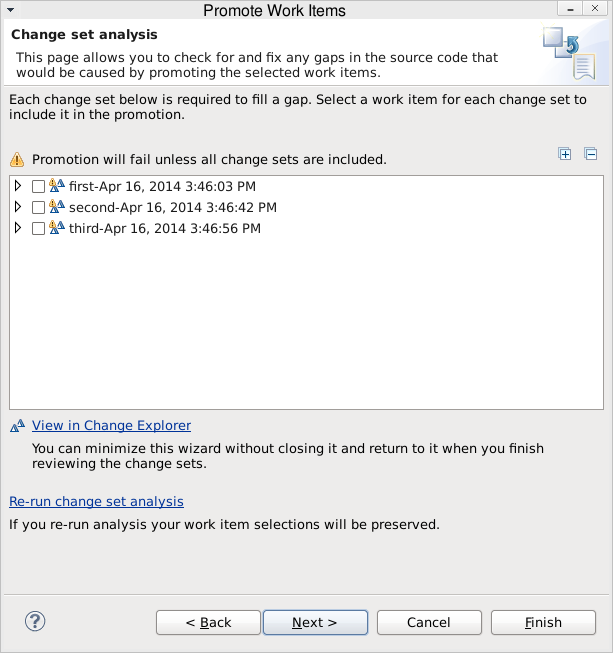 The work item promotion wizard has a new page that detects gaps in change sets. The wizard generates a list of the change sets that must be included to fill the gaps. In previous versions of Rational Team Concert, the gap error is reported, but you had to determine which change sets to add to fill the gaps before the promotion could run successfully. The work item promotion feature has a follow-up action to automatically run a target build. You can now use an option to limit the follow-up build to include only the files from the promoted work items. The Enterprise Extensions dependency build feature can now detect programs that depend on build output that was generated by a previous build. Now, those programs are rebuilt automatically in the next build. Translators in language definitions can now be run conditionally. z/OS translators can now set conditions to DD allocations and concatenations. You can add properties to language definitions. The properties apply to the language definitions but not to the remainder of the build. Translator return codes are now available as Ant properties, which means that you can use the properties in a condition in a language definition or translator. The format of the property is STEP<the_number_of_the_translator>_RC. For example, the first translator's return code property would be STEP1_RC. In addition to listing the promoted change sets, the report for work item promotion now lists the change sets that were skipped because they were previously promoted to the target stream. In the promotion and packaging wizards, you can run a query to find work items to be promoted or packaged. In previous releases, the promotion and packaging wizards did not support queries that included parameters that prompted users to provide values. Now, you can use queries with parameters to select work items for promotion and packaging. The queries have the same function as they do in the query editor. Previously, when you ran a source-only promotion, the state of the output was not validated because the output was ignored. A new precondition was added so that this validation can be enabled for source-only promotion. You can use this option to ensure that a source is only promotable if it has been built, and that all the source files related to the output are being promoted. This option ensures that rebuilt output in the target stream matches the output in the source stream. The precondition also has an option to allow the promotion to continue when the validation fails. The preconditions can be configured so that only certain roles can allow the promotion to continue when errors occur. In previous releases, only one rollback archive was saved for deployment, which meant that you could only roll back to the last deployed package. The deployment feature is now enhanced so that you can save an unlimited number of rollback archives. You can also set a maximum number of rollback archives to save for each deployment definition. If a limit is set, the oldest rollback archives that exceed the maximum are removed. If no maximum is set, you can delete obsolete rollback archive directories manually, or you can configure an automated process on the deployment server to remove the archives according to criteria that you set. When you run a deployment rollback, you can select the package to roll back. If you have any unchecked-in local changes in your sandbox, you can now accept incoming change sets. In this case, a new warning dialog box is displayed with three available actions: Check-in and Accept, Accept, or Cancel. The mass import tool, the zImport command, is now available with the lightweight SCM environment (lscm). Customer feedback shows that the templates most used in production are the Scrum and Formal Project Management templates. Due to the lack of customer adoption, the OpenUP and Simple templates were removed in version 5.0.1 to make room for additional templates in future releases. Any existing Rational Team Concert servers that have the OpenUP and Simple templates deployed will keep them after upgrading. Any new servers will have only the Scrum and Formal Project Management templates. 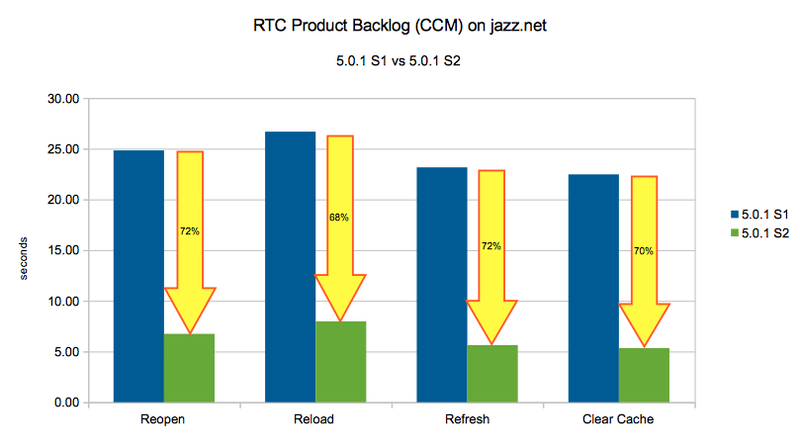 The OpenUP and Simple templates are available for download on Jazz.net for customers who want to continue to use them as custom process templates.